Can someone identify the source of these spectacular branches, dripping in red berries? I parked in front of a fence at the bank this afternoon and waited for my husband to complete a transaction. Fiddling with radio stations I sat in the car for several minutes before finally looking around and noticing these berries shouting out for attention. Here are a couple more pictures that better show the leaves. 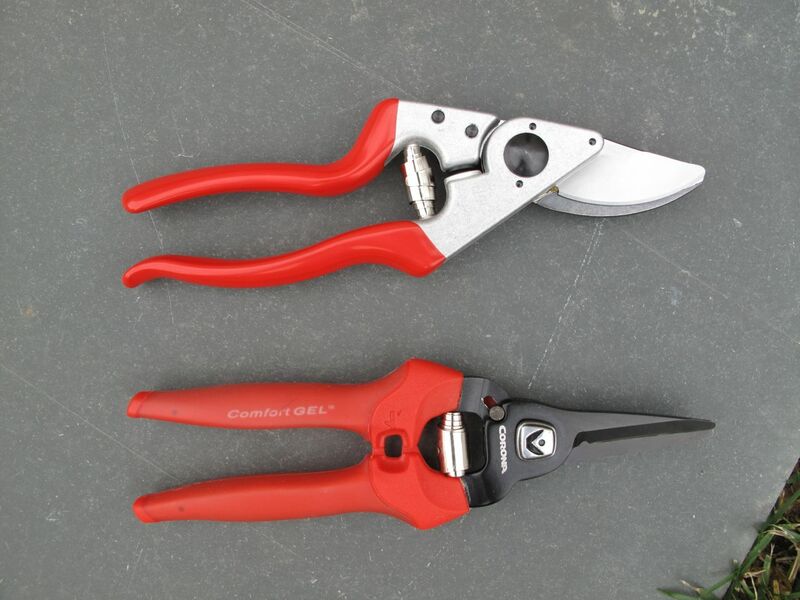 Two more red items were among my favorite gifts on Christmas morning—Felco 8 Classic Pruners and Corona Floral Snips. During a wreath-making workshop a few weeks ago I dropped and broke the handle of my inexpensive but trusty flower clippers. The new Corona Floral Snips Corona Floral snips have a built-in wire cutter and thorn stripper that will be useful when I am working on floral arrangements. The Felcos I learned about through Carolyn’s excellent tools article and can only hope mine last as long as hers, which she has had for over thirty years. I am actually looking forward to tackling some pruning jobs now. Thanks Santa! This entry was posted in garden and tagged pruners, red berries, winter garden on December 30, 2013 by pbmgarden. How festive those berries are! I am pretty sure it’s Pyracantha – our neighbours have a wonderful specimen. Cathy, I think you’re right. Don’t know why I didn’t recognize it but it didn’t look as thorny as I remember pyracantha being. Enjoy your new garden tools–what fun! Thanks Michael. 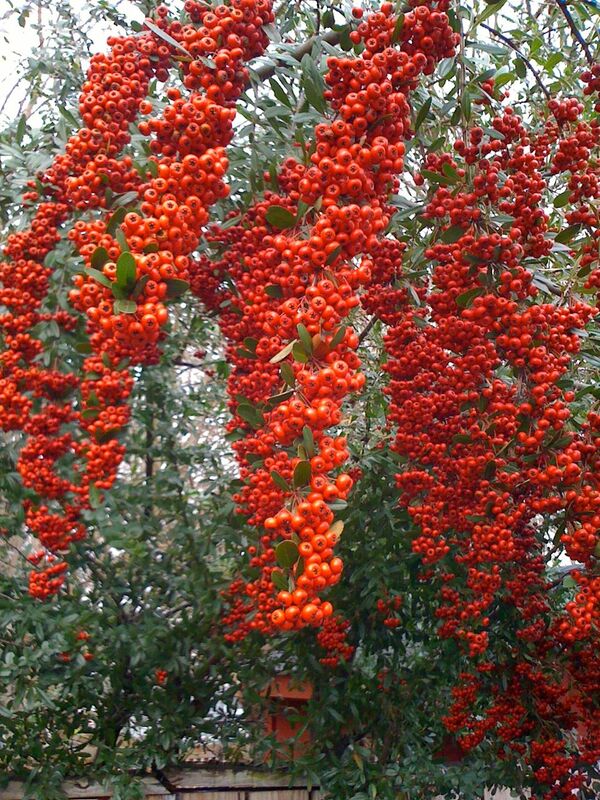 It is taller than I’ve ever seen, but I did look it up and Pyracantha can get to 12 feet. Yes, the tools will be great fun. Happy New Year! Those are some great looking berries. I first thought they were Sea-buckthorn ( also comes in red variety) until I checked on Pyracantha. I think that what it is – Pyracantha. To start with I was thinking Cotoneaster, but then when I saw the leaves on the last photo, decided Pyracantha like everyone else. I hope you’re pleased with your secateurs, I have the same make and they have lasted such a long time now, what a super present! That is quite the show! 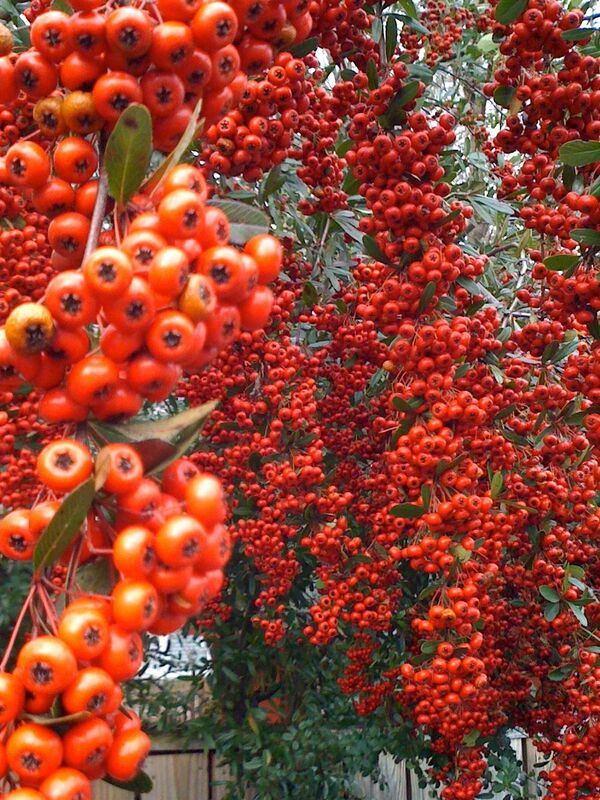 You have me thinking that a pyracantha might be a good choice for my own garden. The thorns are the only memory I have from my parent’s plantings. It might be time to get over that and give it another go. Yes, Santa had an inside tip and was very generous. The thorns are off-putting for selecting pyracantha in my garden, but those berries are attractive. Sorry I forgot to comment on the Felco secateurs. I had a pair when I was 21 and they broke last year when i reached 62 so they lasted 41 years. I repaired them and am using them again but just for light work. Good to know. Hope my Felcos last as well as yours. If I’m still gardening in 41 years I’ll gladly repair/replace them. Looks like a glorious feast for the birds and perfect Christmas gifts too! best wishes for a happy New Year. Yes, the birds should be happy with these berries. There was an interested squirrel hanging around as well. Hope you have a Happy New Year too Julie! And a good gardening year to you as well Christina. Looking forward to trying out my Felcos. 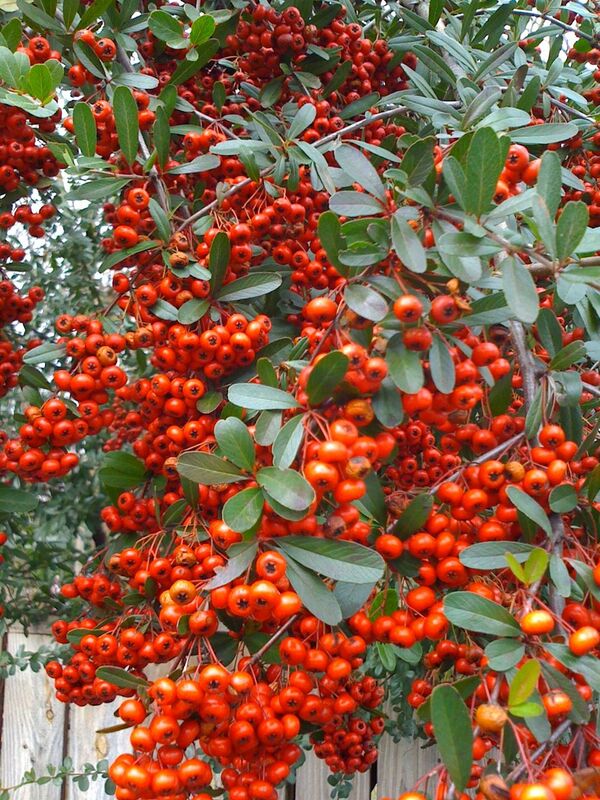 Definitely Firethorn: Pyracantha coccinea. The berries are beautiful but the thorns are absolutely vicious. Felcos are just the best. Chloris, thanks for helping identify this plant–the thorns are something I don’t want to add to my own garden. And another Felco owner! They must be the best. The berries are exceptionally beautiful. May parents had a couple of these shrubs and I remember the red-orange berries. Only hardy to zone 6, unfortunately. Yes, I think the berries are dramatic, but many people have mentioned the “thorny” problem, so this shrub is something to admire from afar it seems. Thanks for linking to my tool post. I am so glad it was helpful. You will have to let me know how you like the number 8 Felcos, I have number 2. They are a joy to use. I also recommended the Corona floral snips which have now become the tool I always have in my pocket. Happy New Year. Perhaps there are some different varieties of pyracantha that are more floriferous and not as thorny. It would bear exploring. That’s a good idea–so many hybrids these days. I’ll let you know if I come across a less thorny version. Or one of my neighbors could plant one in a perfect spot where I could see it would work for me too! Wow, what a lot of berries. I’m in agreement that they look like pyracantha, too.I’d always thought pyracantha was only grown as a vine until I saw several pyracantha trees in a local parking lot. They were amazing and, in my opinion, much more interesting with their berry laden branches than any of the vines I ‘d ever seen. Debbie, these were more tree-like. I’m used to seeing them about the size of a 5×6 spirea, with arching branches. Annette, I admire Pyracantha when trained but I know myself too well to go down that path. Hope your new year is off to a good start. s.